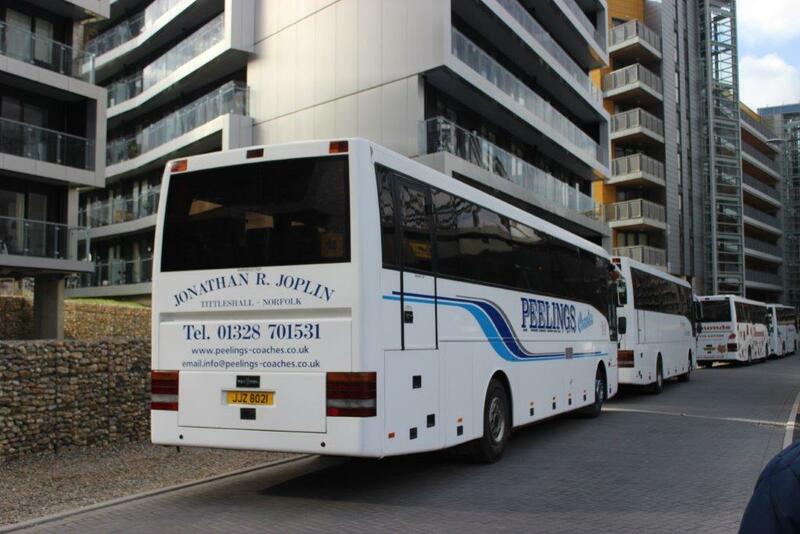 Jonathan Joplin’s surprise offer of a ticket to last Saturday’s Championship clash between Norwich City and Derby County saw me arrive at his Tittleshall yard at 12.20, by which time the first green and yellow scarves were already boarding one of Peelings’ Van Hool Alizee T9 Volvo B12Ms. Setting off we called at a succession of villages and drive ends, picking up more folk at each of them. For every one, Jonathan had a friendly greeting, frequently by name and always reciprocated. There were questions about the absence of an absent regular. He’d waved from his crutches as we’d passed his house, a fall down a manhole while unblocking his drains having prevented his usual participation. Talk turned to the match, the possibility of moving up a tight table and who’d be playing. At one stop, when I thought everybody had boarded, we waited another few minutes and, sure enough, a local councillor came up the road, exchanged pleasantries and boarded. As we approached Norwich, I was a little surprised to see a Norfolk Green Tempo branded for the 505 Kings Lynn to Spalding service, but obviously needed for other duties. Traffic meant that we arrived a few minutes after 1400 and there were already four coaches parked ahead of us on the ground’s perimeter road. 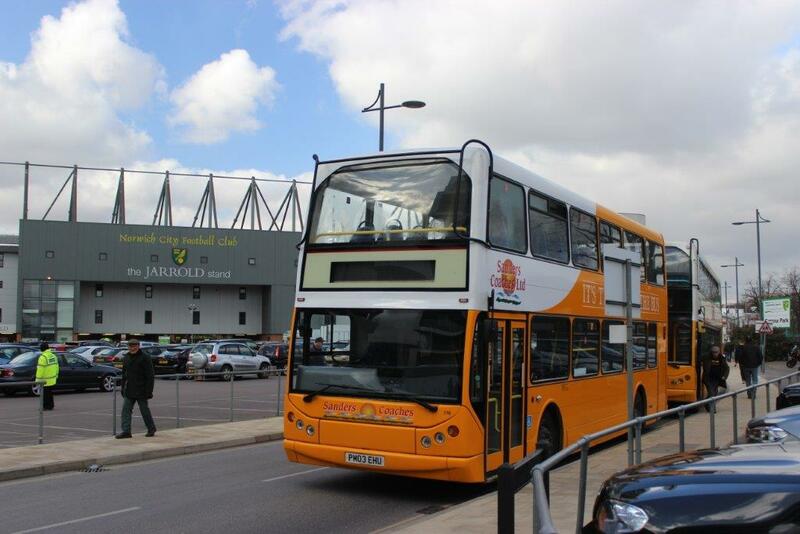 We bought a copy of the weighty programme, called OTBC in a reference to the club’s incomprehensible song, ate excellent fish and chips from the van and watched a succession of other buses and coaches arrive. Among them were no less than four double deckers from Sanders of Holt, one driven by Charles Sanders himself. With ten minutes to kick off, Jonathan helped the last couple of passengers off, locked up and we took our seats on the opposite side of the ground to Delia Smith and her Mum. Two guys sat behind us discussed the merits of different fruit pastille brands and passed them round for our opinions. Norwich played well, Jerome scored one and should have had more, Derby played less well and were lucky to get a goal when the Norwich keeper failed to hold a ball that he appeared to have in his hands, so it ended 1-1. Jonathan left ten minutes before the end to unlock the coach and at full time I ambled back. Everyone was on board well before the 17.15 mass departure and we even managed to squeeze on board an extra lad and his dad who were going our way. We listened to Canary Call on the local radio with people who claimed to have been at the match talking rubbish about different players’ performance. There was virtually no criticism of the goalie, rather recognition of the times he had pulled off fabulous saves in the past. Driving home later, safe in the knowledge that Aston Villa had put four past Sunderland, I reflected on what a civilised day it had been, what a great family atmosphere there is at Carrow Road, and how much would be lost if rural operators weren’t there to serve rural communities.